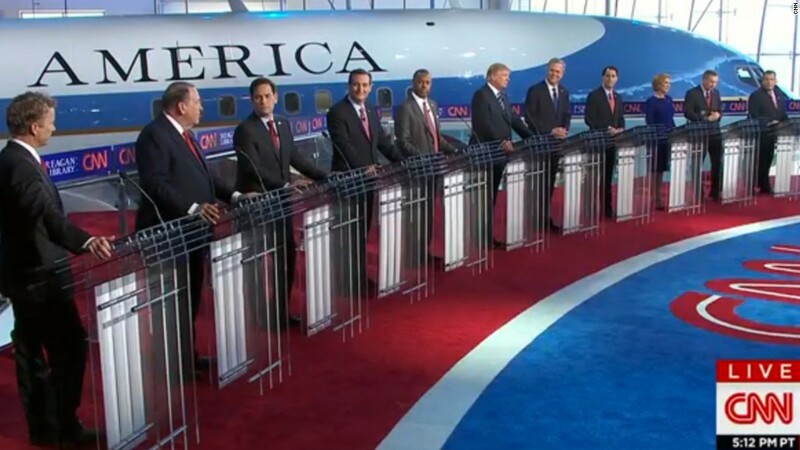 Wednesday's prime time GOP debate averaged 23.1 million viewers, making it the most-watched program in CNN's history. The 6 p.m. "undercard" debate drew 6.3 million viewers. These are NFL-level ratings -- affirming that the Donald Trump fueled Republican debate slate is one of the most popular television shows of the year. For comparison's sake, CNN's most-watched presidential primary debate before Wednesday was a Democratic debate on January 31, 2008. It had an average of 8.3 million viewers. CNN's most-watched program overall was a special "Larry King Live" episode in 1993. The episode featured Al Gore and Ross Perot debating NAFTA and averaged 16.8 million viewers. Wednesday's matchup easily surpassed that total. It was slightly lower-rated than Fox's GOP face-off one month ago in Ohio, though. That prime time debate, the first of the season, averaged 24 million live viewers. Fox's earlier debate that day averaged 6.1 million. What accounts for the difference? For one thing, Fox's main debate was two hours long while CNN's was three hours. From a campaign's perspective, longer might have been better, because it gave the 11 candidates more time to talk and argue. It also gave CNN more time for commercial breaks. But the length probably diminished the overall ratings. That's because the ratings are an average of minute-by-minute viewership, so if viewers didn't stay for the whole program, the average was lower. CNN's audience grew exponentially starting at 5 p.m., when about 1 million viewers were tuned in for pre-debate coverage. The 6 p.m. hour, featuring the beginning of the "undercard" debate, averaged 4.8 million viewers (with many more toward the end of the hour). The 7 p.m. hour, with the rest of the first debate and analysis from CNN commentators, averaged 7.2 million. Then the audience really surged. The 8 p.m. hour averaged 20.7 million viewers. The peak came in the 9 p.m. hour, right around the middle of the main debate, with an average of 24.7 million. Some critics said they thought the debate began to lose some steam in the 10 p.m. hour. The ratings indicate that there was only a modest drop-off -- from 24.7 million at 9 p.m. to 22.5 million at 10 p.m.
Nearly 20 million were still watching when the debate ended at 11:15 p.m.
Wednesday's debate also set a live-streaming record for the network. At its online peak around 9:45 p.m., there were 921,000 concurrent users on CNN's live stream, easily making it the most-watched web stream of a primary debate ever. The ratings show that these GOP debates are drawing viewers who've never bothered turning on a debate before -- largely due to Trump's presence. Primary debates at this point in the 2011-2012 campaign cycle averaged 4 to 5 million total viewers each. Trump tweeted about Wednesday's ratings when he heard about them on Thursday afternoon. He said he wondered if CNN would send him "flowers and a thank you note." In the key advertiser demographic of viewers ages 25 to 54, CNN's debate averaged 7.06 million, versus 7.94 million for Fox's debate. CNN's event skewed a bit younger overall: It averaged 2.74 million viewers ages 18 to 34 versus 2.56 million for Fox's. Historically the most popular events on TV have been shown by broadcast networks, not cable channels like CNN. According to Nielsen data, Wednesday's debate ranked as the #10 cable program ever, behind 8 college football games on ESPN and the Fox debate last month. Update: an earlier version of this story said the prime time debate averaged 22.9 million viewers. Later in the day on Thursday, Nielsen's ratings were revised upward to 23.1 million.